"The Little Ratzinger" to head CDW? What news from the Colloquium? "This is the development of the Latin form of the pallium used up to John Paul II," explains the Master of Papal Liturgical Celebrations, Monsignor Guido Marini, explaining historical and liturgical reasons for the new insignia in this interview to "L'Osservatore Romano." What are the elements of continuity and innovation compared to the past? In light of careful studies, regarding the development of the pallium over the centuries, it seems that we can say that the long pallium crossed over the left shoulder was not worn in the West as from the 9th century onwards. Indeed, the painting in the Sacred Cave of Subiaco, dating back to ca. 1219 and representing Pope Innocent III with this type of pallium, seems to be a deliberate archaism. 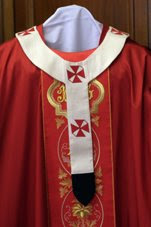 In this sense the use of the new pallium intends to meet two requirements: first of all to emphasize more strongly the continuous [organic] development which in an arch of more than twelve centuries this liturgical vestment has continued to have; in second place the practical [requirement], because the pallium used by Benedict XVI since the beginning of his pontificate and has led to several annoying problems from this point of view. There remain differences between the papal pallium and the one which the Pontiff imposes on the archbishops? The difference remains even in the current pallium. What will be worn by Benedict XVI from the solemnity of Saints Peter and Paul onwards takes the form of the pallium used up to John Paul II, albeit in a larger and longer cut, and with the color red for the crosses. 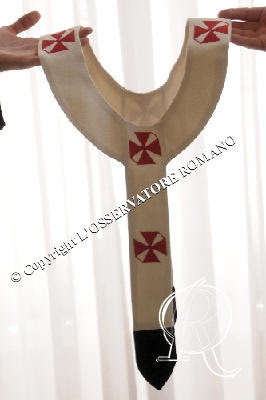 The different form of the papal pallium vis-à-vis the one of the metropolitans highlights the diversity of jurisdiction which is signified by the pallium. Perhaps you will remember a post on this same subject which I wrote in January, The Pallium - History and Present Use. It is both consoling and encouraging to know that my own critical thoughts concerning the form of Pallium introduced in 2005 by the former papal MC are in concert with those of the present papal MC and, it seems reasonable to assume, the Holy Father himself. It is also very rewarding and important for the reform of the reform seeing the emphasis which is given to the principle of organic development, which I have highlighted in the interview above. [SRT: Further to the announced development with regard to the papal pallium, Fr. 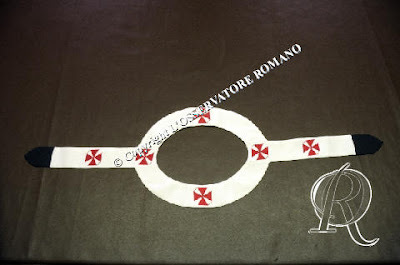 Uwe Michael Lang also has an article about the pallium in L'Osservatore Romano.